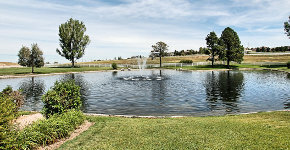 The pond and water fountain located in the NE corner of Parker Rd. and Pinery Parkway were built when the District was first formed. Over the years the Board has replaced the fountain and maintained the pond to create a dramatic water feature that captures the beauty of the District. The District has budgeted to create reserves to replace the fish, aquatic plants and fountain and to assure that funds are available if major repair or replacement of the liner is necessary.